What if you were supposed to die, but you didn’t? And what if, years later, your precious second chance didn’t turn out anything like you thought it would? 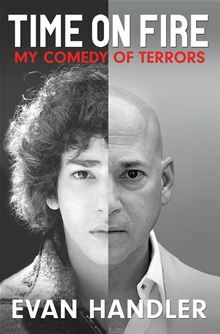 That’s the journey Evan Handler experiences, and the one he explores in It’s Only Temporary: The Good News and the Bad News of Being Alive.In a collection of funny, offbeat, and poignant autobiographical essays, Handler moves beyond the supposedly “incurable” illness he triumphed over in his mid-twenties–only to tumble through his thirties and forties in search of ever elusive love and happiness. From bold attempts to rekindle his acting career to hapless efforts to run faster around New York’s Central Park reservoir, from bizarre Internet dates to twenty-seven breakups (involving only ten women), Handler careens through his against-all-odds existence. Always searching for meaning in his unlikely survival, he shares stories of sadistic junior high school gym teachers, bullying wannabe Hollywood moguls, returned engagement rings, and Europeans’ fascination with American bathroom habits. Picking up ten years after his first book, Time on Fire, Handler again uses what the New York Times calls his “laceratingly funny and revealing” storytelling skills to weave twenty-one new tales into a defiantly unconventional memoir. Consistently witty and insightful, Handler’s stories shift effortlessly from the comedic to the profound, musing with equal intensity on the existence of God and his experiences with TV stardom. Then, just when it seems he’s failed to make the most of his astonishing second chance, Handler finds his way to miracles even greater than the ones that saved his life. His memoir describes his journey from darkness to light, from yearning to gratitude, and in so doing succeeds as both a stirring love story and a classic coming-of-age tale. It’s Only Temporary celebrates the transformation of a boy to man—even if it look Handler more than forty years to get there. Based on Evan Handler’s hit off-Broadway play (called by The New York Times “laceratingly funny and self-revealing”), Time on Fire is a remarkable memoir of illness and survival, love and hope—shot through with anger, humor, and piercing eloquence. 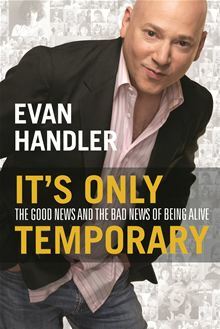 Evan Handler was twenty-four and already an accomplished actor when he was diagnosed with acute leukemia and told that his chances for survival were slim. Resigning his role in Neil Simon’s Biloxi Blues, Handler checked into New York Memorial’s Cancer Center and began a bizarre, sometimes uproarious five-year journey in and out of hospitals—“a raucous rump through Hell”—only to face an equally arduous return to the life he left behind. Time on Fire is the story of Handler’s passage into a twilight world: a place of lonely, haunting despair lit by moments of exultation and hilarity; a world where the truly horrible and the hysterically funny not only coexist but seem to become the same thing. Told with the trenchant humor of a survivor, it takes a wry, unflinching look at the absurdity of fighting for life in a place where death is what is most expected, and a health care system on the brink of madness. It is the story of refusing to succumb to the pressures of conformity that threatened his recovery and of the fierce struggle to find the road back to health—at all costs. From the comic accounts of his trip to a Madison Avenue sperm bank (“Nothing but the best address for my progeny”) and his experimentation with psychic healing, to the portrayal of the unraveling effects of his illness on his family and girlfriend, Handler records with astonishing precision the full emotional range of his experience. The result is a bracing, achingly poignant account of his determination to steal time and reclaim life. Glowing with uncommon insights and uncompromising honesty, Time on Fire is a testament to the bravery and the endurance of the human spirit.